Aster Medicity is one of the largest multi-specialty quaternary care hospitals with 8 Centres of excellence in Kerala, established by Aster DM Healthcare which is founded by Azad Moopen. A 670-bedded hospital with excellent outpatient and inpatient services along with critical care and emergency services, operating under highly trained and qualified medical experts and staff. This hospital has brought together most advanced technology, state-of-the-art infrastructure, and soothing surroundings along with some of the best specialist to ensure outstanding clinical care and quality treatment. Facility for Minimal Access Robotic Surgery (MARS) using high precision da Vinci Surgical System. Imaging and Diagnostics department is equipped with 3 Tesla MRI, 256 slice CT Scanner, Digital Mammography, The Dexa, Digital X-Ray, Time of Flight PET/CT, Colour Doppler Systems electronic 4D Imaging and Ultrasound Machines with multimodal image fusion. Catheterization Lab Allura Clarity system, Flat panel Bi-plane Hybrid Cath Lab for high clarity image results at an unmatched speed, for accurate diagnosis. Emergency Department, Intensive care Unit ambulance service, pharmacy and blood bank are operational round the clock. 22 Operating Rooms fitted with ORI Fusion Digital Integrated system for complete digital integration. Strict policy for Stringent Infection Control. First in India to introduce Robotic Pharmacy using ROWA Vmax – a state-of-the-art fully automated medication storage and dispensing unit that ensures quick and accurate dispensing of medicines. Aster Medicity is a highly reputed and internationally recognized hospital facilitated with cutting edge technology and international standard quality services. The hospital is an acknowledged name for medical tourism in India for providing comprehensive health care services and advanced procedures at a reasonable price. There is separate International Waiting Lounge for patients where they can complete further formalities like Registration, verification of passport and VISA, signing of the consent forms. There is an appointed Guest Relation Team which provides assistance to the patient wanting to travel for their treatment and ensures that they receive proper medical attention. Nearest Airport: Kochi International Airport which is 20 km from the hospital and 30 min drive away by road. Nearest Railway station: 4 km away two Railway Terminals – Ernakulam South and Ernakulam North. 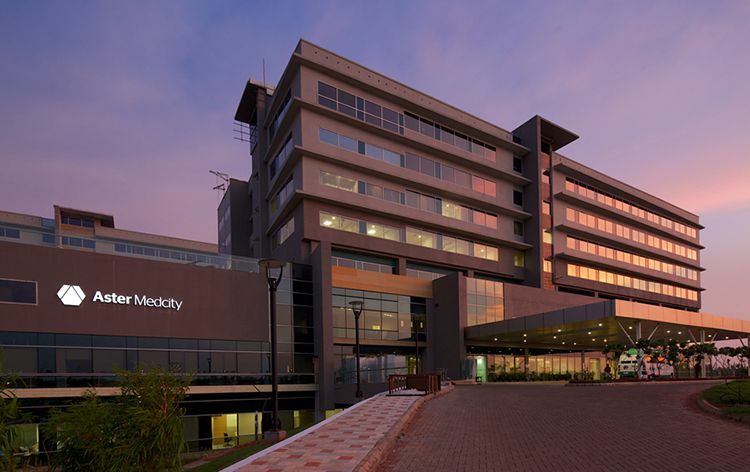 Aster Medcity performs 386 different procedures. Click on a procedure name to see more details and to view doctors for that specialty. 4.4 average based on 50 reviews.